Whether you’re a bride, a bridesmaid or a random guest, sorting out a wedding look can be tricky. Every Indian Wedding has 53768 wedding functions; which means getting all those wedding outfits can be quite a task, not to mention burn a black hole in your wallet! But what if we told you that you can get all your wedding jewellery at totally affordable rates with beautiful designs? And you can even get every single stunning piece of bling that your heart desires! That’s right, imitation jewellery is totally the way to go. Not only do they cut quite a few zeros off your bill but have even more creative, unique jewellery designs. What’s more is we did all the work and found the perfect store! 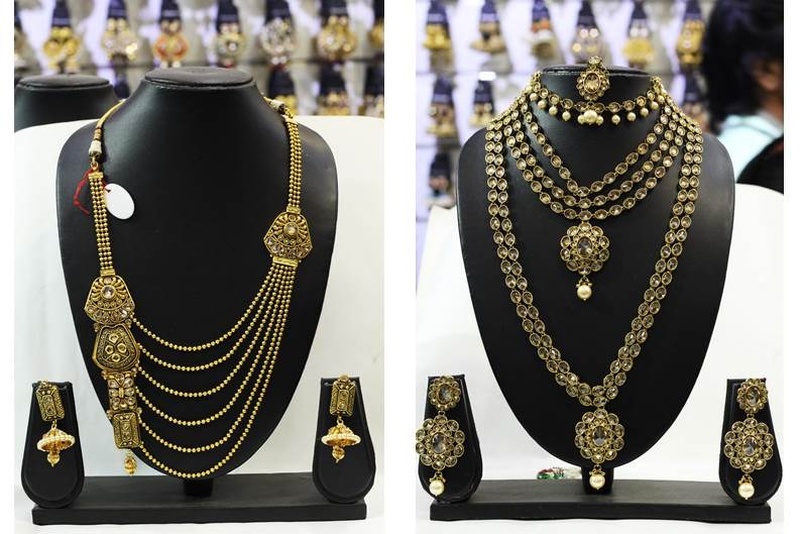 Starlet in Lokhandwala market, Andheri West sells some of the most gorgeous imitation bridal jewellery sets in town. The store has been around for around 4 years and has new updates in designs and trends every 10 days! And don’t we all hate seeing the same stuff on other people? Especially when it’s wedding-related! Starlet store sure makes us feel like anything we get from there is exclusive and one-of-a-kind. They have earrings, neckpieces, bangles, rings, entire wedding jewellery sets and every other accessory you can think of! 15-20% cheaper than the market! But what we love about their price points is that they seem to have something for all price ranges. For example: a bridal jewellery set can be priced anywhere from 800/- to 8500/- depending on how fancy you want it! For imitation jewellery, the materials they use seem rather great. Most jewellery is set in copper, coated in micro polish for that stunning shine. For stones, they use American diamonds, cubic zirconium. Some of the products are imported while some are locally available. We also loved their super-cute indie potlis. They range between 600/- to 2000/- . Seeing as each one is handcrafted by karigars, this sounds like a steal deal!